← Exhibit Reception a Great Success! It has been a number of months since I’ve shared photos on my blog. 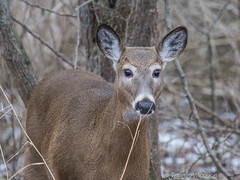 I have still been visiting local nature areas during the fall and early winter and have taken dozens of photos. Somehow, they just never made it to my blog. Life has been getting in the way! 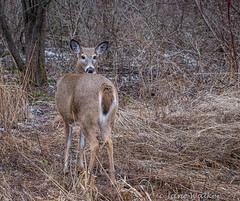 Recently, I had an amazing experience at Lynde Shores in Whitby. I noticed a red-tailed hawk perched on a 3 foot high stump about 10 feet away. With my 100 – 400 mm lens, I actually had to back off to fit this magnificent creature into the frame. The hawk sat there, intent on some small prey in the grass and leaves, for at least 10 minutes. Snap, snap, snap……It was a grey day so the images are a bit “flat” but that was the closest that I have ever been to a hawk and it is unlikely that I will again. 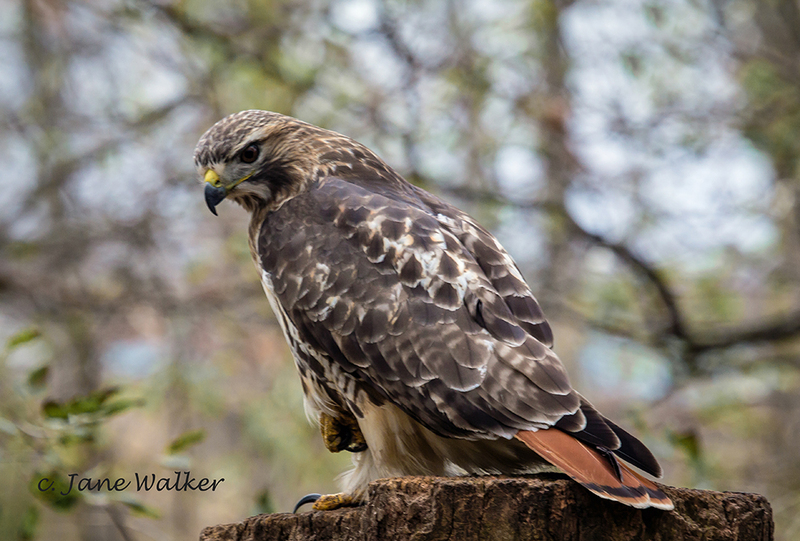 I hope you enjoy these shots of this hawk in his natural surroundings. Your comments would be appreciated…. Red Tailed Hawk at Lynde Shores, Whitby. Is he looking at me as prey? 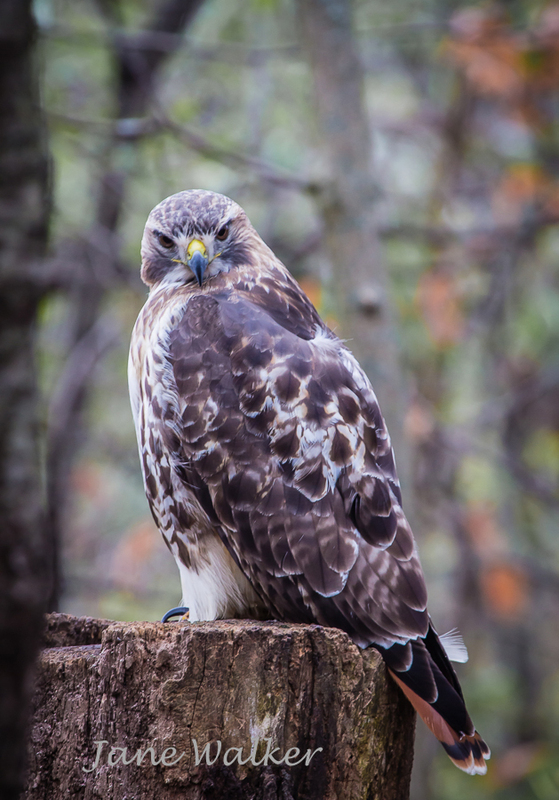 I can now delete about 200 previous hawk photographs from my computer! This entry was posted in Photographs of Birds and tagged 100-400 mm Canon lens, Birds of Prey, Hawks, Lynde Shores, Lynde Shores Whitby, Nature Photography, Perched Birds, Red Tailed Hawk, winter photography. Bookmark the permalink. Thanks, Debi. Now I’m hoping my next sighting will be on the Snowy Owl down at Bond Head! Lovely shots . Nice of him/her to pose in the perfect spot. Yes, Tim. It was a very lucky moment. Hope you have lots of wonderful photographic encounters during 2015! Gorgeous creature. So love the profile shot of his back and his lovely red tail. So glad you like the photos, Eveline. It encourages me to post more regularly. These are terrific! 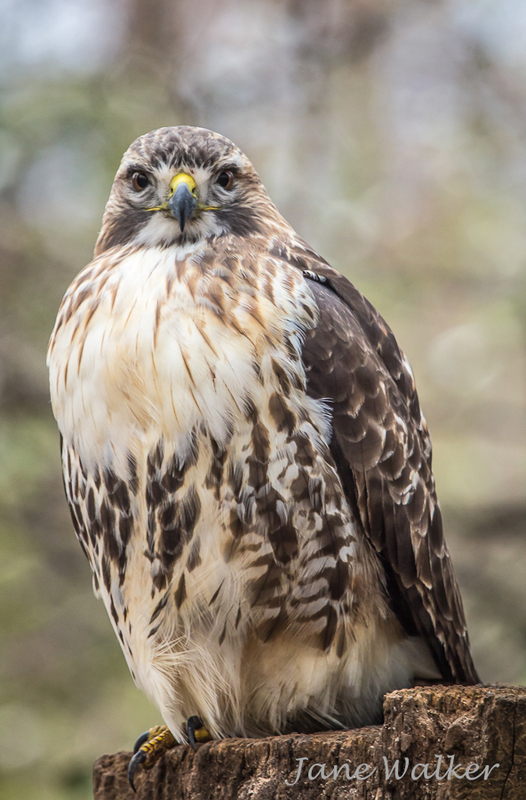 The second one could be captioned “Here’s looking at you, kid!” Who knew Red Tailed Hawks had such expressive faces? Amazing shots! Yes, that is quite an intense stare. Perhaps he/she was challenging me in case I was after his prey! Thank you, Jocelyn. I believe I just waited a bit too long to post and then couldn’t get back to it. 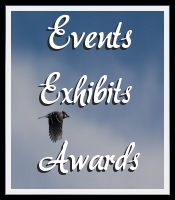 For entries at our camera club, the bird ones that score best, seem to be those with very simple blurred backgrounds, Personally, I like the ones which show a bird or animal’s natural habitat. Some, like these are probably better for one of my bird books or my blog! Happy New Year to you. too. Your encounter was nothing short of miraculous. Exceptional photos! You are right about miraculous! To have this creature right at eye level is so unusual. 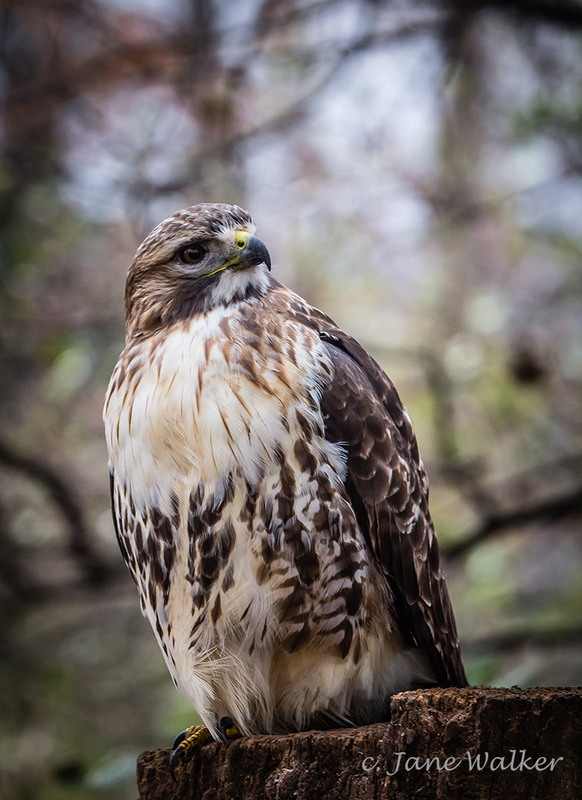 Most of my older shots captured hawks behind branches and high up on trees. 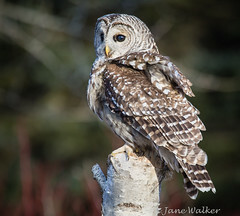 Jane – Absolutely beautiful shots. Thanks for sharing. Happy New Year. The photos are spectacular! What a treat for you! Yes, Ginette, it was an amazing encounter. What a magnificent creature. Great shots. Thank you for your comments. The hawk is magnificent isn’t he?